I have never been a fan of statement pieces when it comes to jewelry. Well, maybe except for those few years when I was a teenager and stacking up rings on each finger was all the rage. Until I got stuck behind a door handle in a hurry and almost tore my finger off. That was the end of it LOL. After that I didn’t wear jewelry for years. Geraldine Saglio of French Vogue sparked my interested for dainty, delicate jewelry. Or bracelets, to be more exact. I spotted a street style picture of her online in 2011 and loved the fine silver bracelet in combination with the knitted sweater she was wearing. I was able to find out that it was from Tifanny & Co, Elsa Peretti’s Diamonds by the Yard collection. I’ve mentioned that I bought it in 2011 to celebrate my first job and how happy it made me. And then, I lost it. It’s been two years and I’m still upset about it. I know, it’s just a simple silver bracelet with a small diamond. But I loved how delicate and understated it was. It was also such a nice reminder of my accomplishments thus far. I own the necklace as well, but it’s not the same. Do you think I’m crazy for considering this bracelet once again? Have you ever purchased the same thing twice after you lost it the first time? 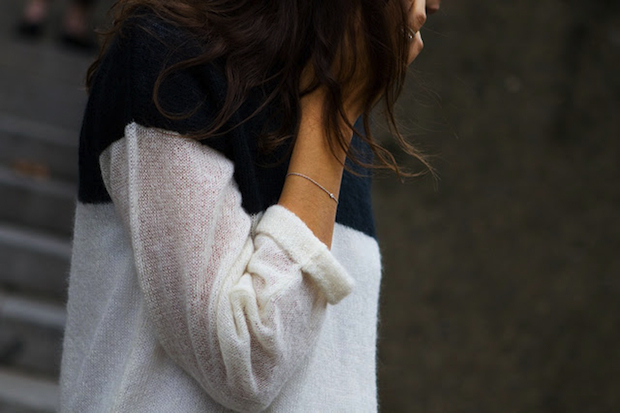 Will we ever get enough of the breton shirt? I sincerely doubt it as it has been a classic for decades. Think, Picasso, Audrey Hepburn etc. I admit, I took me a while to finally appreciate this timeless piece. My first striped top was a cheap black/white shirt years ago. It didn’t get the wear it deserved. Mostly because my closet was filled to the brim and also because it looked awful after just a few washes. Quality brands such as Saint James and Petit Bateau were still unknown to me. After that, I decided to save up for a Comme des Garçons shirt which I bought at Dover Street Market in London. I’m usually not one to go for visible logos but I couldn’t resist that tiny red heart. As of recently, I’m now the owner of two Comme des Garçons shirts, an old H&M blouse and an A.P.C. t-shirt (my latest addition). All striped but still different enough to warrant the purchase. Which brings to mind the question: how many striped shirts is enough? Do you own any striped tops? What is your favourite brand?